Santa, ornament, and snowman royal icing decorations coupled with green holly and red berry candy confetti make these pretzels the perfect choice for Christmas party favors. 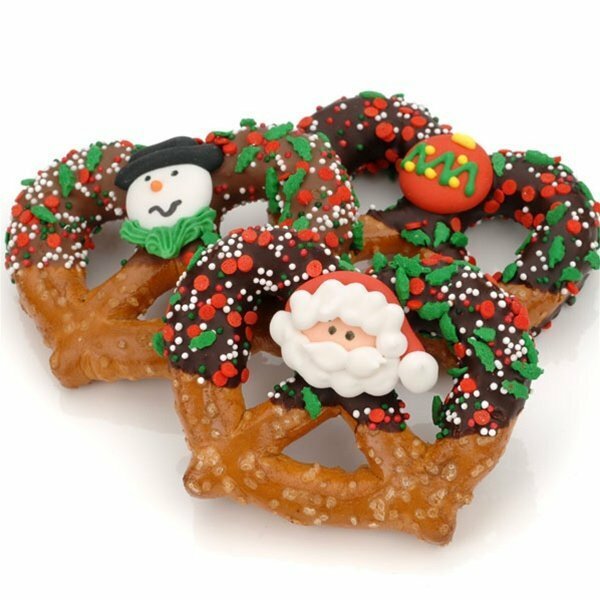 A large pretzel twist is dipped in fine Belgian chocolate (white, dark or milk) and then finished with the aforementioned decorations. They are fun, festive and oh so tasty! The minimum order is 12 individually wrapped pretzel twist favors. Price shown is per pretzel twist. Each pretzel is individually wrapped in a cellophane bag and heat-sealed at both ends for freshness. Pretzels measure 3" x 2" each. NOTE: Bulk items include a mixture of pretzels with royal icing decor and sprinkles and pretzels with sprinkles only.